Carla Bruni, the French First Lady, sparked outrage across France as she showed off expensive diamond earrings during a state dinner in Mexico City on Monday night. 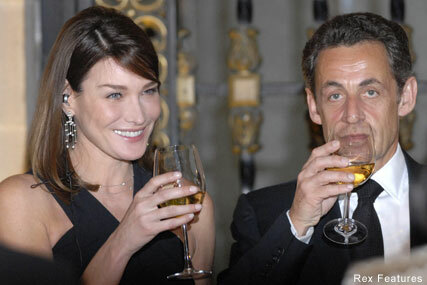 President Nicolas Sarkozy and his wife were in Mexico to hold talks with President Felipe Calderon. The couple are staying at the luxurious El Tamarindo Beach and Golf Resort on Mexico’s Pacific Coast. Their beachfront villa with private pool, outdoor Jacuzzi and full staff costs a staggering £3,100 per night. At a time when French unemployment is set to reach two million and the average worker takes home the minimum wage of £8 an hour the actions of the Bruni-Sarkozy’s have enraged voters. Likening them to Louis XVI and Marie Antoinette the French public have turned against the pair resurrecting his nickname of President Bling-Bling. Sarkozy, 54, is known for favouring expensive brands like Rolex and Ray Bans but after his marriage to Bruni, 41, in February last year the couple made an effort to tone down their extravagances. But earlier this year they travelled to the French resort of Megeve for a skiing trip with 19 bodyguards. In Mexico they are being given round-the-clock protection from the Mexican army. With security the estimated cost of their break stands at £45,000.